Associate Professor Reza Ghodssi's (ECE/ISR) LPS and NSF-sponsored III-V Optical MEMS activities, including the first InP optical waveguide MEMS switch, are featured in the March 2006 issue of Compound Semiconductor magazine. Ghodssi's current work on InP MEMS environmental sensors is also highlighted in the article. 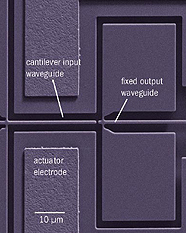 The photo shows the cantilevers that offer on-chip detection of explosive materials by monitoring the light transmitted between the cantilever and the fixed-output waveguide. The cantilevers are coated with a thin chemically sensitive material that interacts with the material to be detected, leading to an increase in the cantilever's mass and a shift in its resonant frequency.